Meghan Wiczynski - Week 1 Autoimmune Paleo Calendar and Recipes! Home/Uncategorized/Week 1 Autoimmune Paleo Calendar and Recipes! It’s that time of year where the #1 New Years Resolution is to LOSE weight. I get it I’m right there along with all of you. However, my goals go DEEPER. I want to be in “remission” from my thyroid symptoms and with the switch of my nutrition, I am on my way! I wanted to be able to share with you all the recipes and meal plan that I have put together for myself. If this this something you all want to see, I will continue to share these! There are SO many awesome recipes out there for autoimmune paleo! You don’t have to get “bored”, but it will take some getting used to. It’s quite a switch to start eating non processed foods, but your body will THANK you. Here is my week 1 AIP recipes! 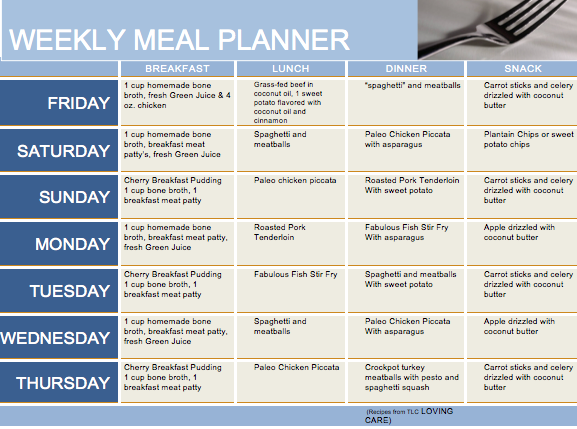 ENJOY If you look below the picture there are links directly to all the recipes on this weeks meal plan!